Silklift Lightening System. Impress with Power. Amaze with Condition. Lightening without compromises - achieve luminous blonde results and shiny, silky smooth hair at the same time with the new innovative SilkLift lightening system. 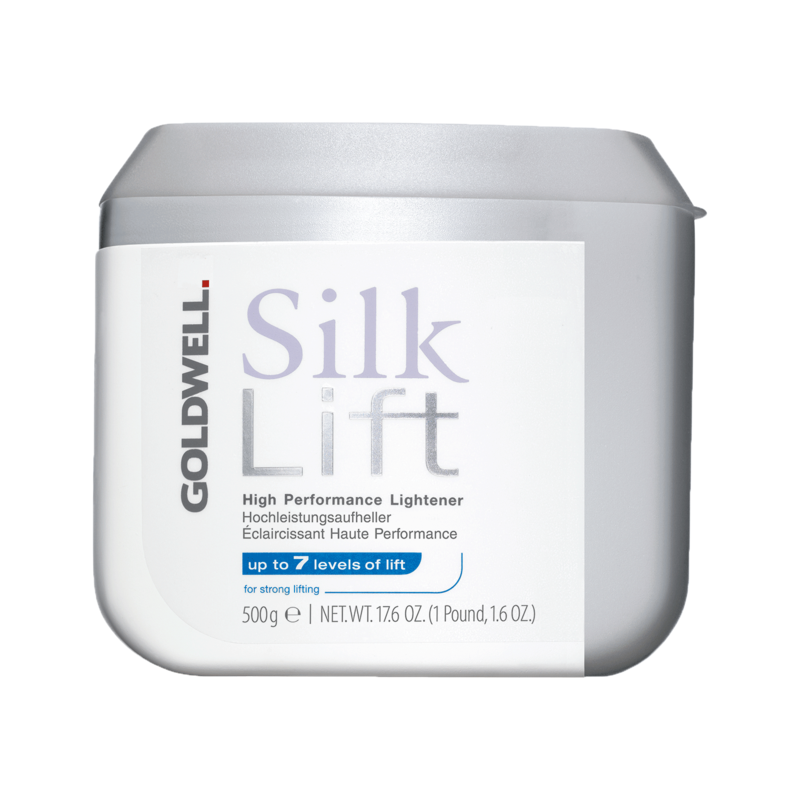 With an upgraded innovative formula, SilkLift Lightener delivers strong and clear lifting with added conditioning for brilliant blonde results. - Gentle lifting of up to 5 levels, ammonia-free for lighter bases and less resistant hair types. 1. Use only with Goldwell SilkLift Conditioning Developer and/or SilkLift Intensive Conditioning Serum. 3. Add and mix the SilkLift Intensive Conditioning Serum to the SilkLift working mass in front of your client for a more professional approach to the color service. 4. Apply mixture evenly to dry hair. 5. Process at room temperature for 10-45 minutes until desired lightness is achieved. 6. Check frequently (every 5-10 minutes) during processing to reach desired lightness. 9. Shampoo and condition using Goldwell color glow IQ Post-Color Shampoo and Color Neutralize Conditioner. 10. If necessary, proceed with a Colorance toning process, then rinse and apply the color glow (IQ).Highlifts or Full Blonde Color Finish Serum, style as desired. 11. Recommend for home care the color glow (IQ) Full Blonde Bright Shine or Highlights Brilliant Contrasts for nourishing/targeted care and luminous brilliance. Designed specifically for lightened hair. - Intensive Conditioning Serum adds additional care for stressed, fine and previously color-treated/lightened hair, as well as create premium services and higher business potential with the new service option. - Ultra creamy consistency for a smooth working mass, with significantly less swelling than other lighteners. "Great lift, and gentle on hair. Love this lightener!" Favorite lightener of all time! "I LOVE this lightener! It has low to no odor, what tiny bit you can smell occasionally is very pleasant, it doesn't stink or take your breath away ever. There is no 'dust' from the powder, it has a good weight that doesn't fly through the air as you dispense or mix. It mixes easily with the developers and has a great spreading consistency with low expansion while processing; great for foiling! As for lift ability, it has done great for me with natural light blondes who want to be platinum all the way to lifting natural black hair color as well as permanent professional & box color black to a pleasant soft golden shade, though not platinum (check out the Ash Silklift lightener for that!). It has always left even the longest processed or double processed hair in great health. No dryness or dullness, always great luster even without following with a Goldwell shampoo regimen. Highly recommend this to any stylist as a great basic go to lightener for any client!"